One size fits most. Modification instructions included. 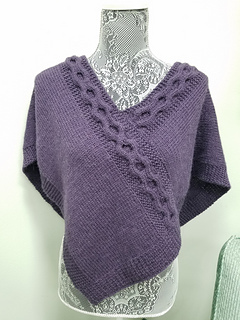 I designed this poncho as a sort of “shoulder hug” to keep my shoulders and upper arms warm but leave my hands and arms free. I also wanted dramatic cables and a pretty edging. 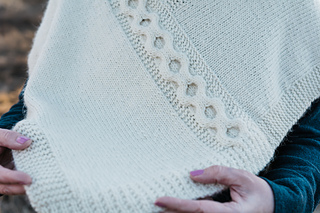 Two identical rectangles are knit flat, then the poncho is assembled with two short seams. 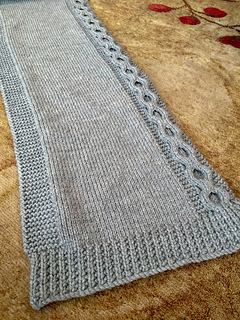 Willow is pretty easy to knit if you have done cabling before. If you haven’t done cables, this is a good one to learn them on. Instructions are included for modifying the width and length. Extra yarn may be needed if so. Probably the most daunting part is constructing the poncho, but I created a conceptual model that you can actually cut out and tape together to see where to make the two short seams. It’s sort of like paper dolls! Not everyone will want to use the model, but it is available for anyone who does. 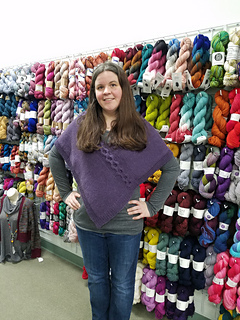 Sometimes seams can be scary, so I’ve put together a tutorial (some written instructions and a 3-minute video just with music, no speaking) here: Cabled Poncho Seam. There’s also a link to the tutorial in the pattern. Pattern includes a schematic, a cable chart, and the above-referenced conceptual model. Check out our group, Knit Equals Joy, for knit-a-longs, swaps, test-knitting opportunities, and occasional giveaways!